Arizona’s population is 29% Hispanic, the fourth-highest Hispanic population share nationally behind New Mexico with 45%, California with 36% and Texas with 36%. 17% of eligible voters in Arizona are Latinos, the fourth-largest Hispanic eligible voter population share nationally behind New Mexico with 38%, Texas with 25% and California with 23%. 37% of Latinos in Arizona are eligible to vote, ranking Arizona 29th nationwide in the share of the Hispanic population that is eligible to vote. 32% of Hispanic eligible voters in Arizona are ages 18 to 29, similar to the share of all Latino eligible voters nationwide (31%) who are in that age range. By contrast, only 22% of all Arizona eligible voters and 22% of all U.S. eligible voters are ages 18 to 29. 19% of Hispanic eligible voters in Arizona are naturalized U.S. citizens compared with 7% of all Arizona eligible voters. Arizona’s Hispanic eligible voters are more likely to be native-born citizens (81%) than are Hispanic eligible voters nationwide (74%). 28% of Latino eligible voters in Arizona have not completed high school, more than double the 13% of all Arizona eligible voters who have not completed high school. 67% of Arizona Hispanic eligible voters live in owner-occupied homes compared with 60% of all Hispanic eligible voters nationwide. Somewhat greater shares of all eligible voters in Arizona (72%) and all eligible voters nationwide (71%) live in owner-occupied homes. 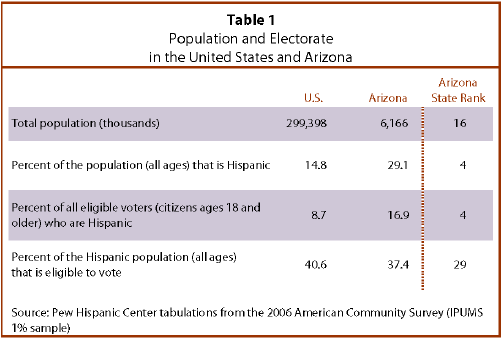 Latino eligible voters outnumber Native American eligible voters in Arizona by more than 4 to 1. Latino and Native American eligible voters are younger than white eligible voters in Arizona. Almost equal shares of Latinos and Native Americans (32%) are ages 18 to 29 compared with 18% of white eligible voters. Hispanics and Native American eligible voters in Arizona are less likely to have completed high school than Arizona white eligible voters. 28% of Arizona’s Hispanic and Native American eligible voters did not complete high school compared with 8% of white Arizona eligible voters. Hispanic eligible voters (67%) are more likely to live in owner-occupied homes than Native American eligible voters (57%) in Arizona, but they are less likely to do so than white Arizona eligible voters (75%).